The Google Search engine has been implementing extra features over the years, not only to improve and refine basic searches. Now we can use the search engine to know directly change currency or the results of some mathematical operations. Now, Google has included a new feature designed to better integrate Google Search with Google Now. 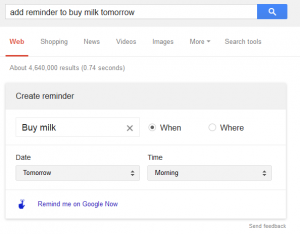 The idea is to enter reminders directly from the Google Search engine, being able to sort them by date, time or location. We can create reminders for specific tasks, for places to visit or events that interest us. These reminders come to us in the form of notification through Google Now, either from Android, iOS and Chrome (PC). 1. We need to have Google Now installed. We need it because it is through Google Now that we are going to receive the corresponding notifications on the reminders we’ve created. 2. We need to be logged in a session on Chrome or Gmail and open Google or new a Chrome window. 3. To create the reminder we just need to type in the search box “remind me” and then the content of the reminder that we want to create. 4. Click on the Search button. We can now set the time and place. A table will appear with all the information from the reminder that we are generating, and we can there configure the options regarding time, frequency and location. 5. 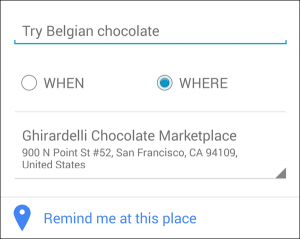 After editingthe reminder details, press “set reminder in Google Now” to generate it. 6. We will receive the notification via Google Now, so if we want to edit the way these notifications come to us, we must do it directly from Google Now. Currently, this option is only implemented in some regions, so that’ll have to wait a bit if it is not available in your country. If in your country the option to create reminders from Google Search is not yet implemented, you can always create the reminder directly from Google Now. Currently, this option is available in German, Korean, Spanish, French, Italian, Japanese, Portuguese (Brazil) and Russian. 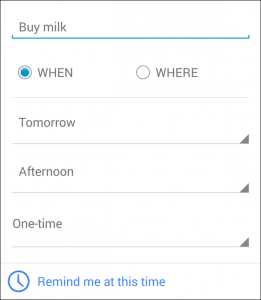 Another way to create it is from the reminders icon located at the bottom of the Google Now’s screen. From there, we can add a new one and select the date, time, frequency or location that we want to receive the notification.